The Blue Jays’ front office had a very difficult task ahead of them this offseason, which overshadowed the value of some of their work. The Blue Jays entered the offseason faced with the prospect of losing Jose Bautista, Edwin Encarnacion, Michael Saunders and more from the 25 man roster. Even with an amazing run of back-to-back playoff experiences and a glut of attendance revenue, most fans understood that the front office wouldn’t be able to bring the whole gang back together in 2017. Fast forward a few months, and the situation is pretty much resolved. Bautista returns on a one year deal, Encarnacion signed in Cleveland and Saunders joined the Philadelphia Phillies. In their place, the Blue Jays signed DH, Kendrys Morales to help fill the void at DH, and the left field situation is still up in the air. While Saunders didn’t get a direct replacement in left field, the Blue Jays made a signing that could pay off for a whole of reasons. 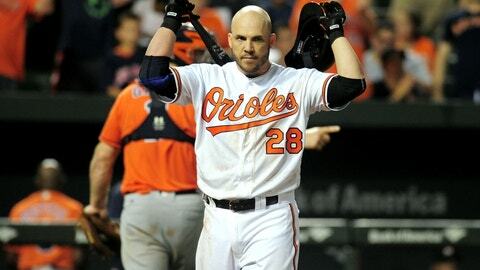 In fact, signing Steve Pearce could be the most underrated move of the Blue Jays offseason. Prior to his signing, our own Jim Scott made a case for why the Blue Jays should pursue Pearce, and admittedly, I wasn’t totally sold at first. That is, until I looked a little deeper. If you’re looking at the “glass-half-empty” side of Pearce, you could argue that he’s a 33 year old (will be 34 in the season’s opening month) who has never had more than 400 at bats in a season, and has played primarily as the right-handed portion of a platoon at first base. When you put it like that: Whoopity Doo. However, there is a lot to like about Pearce’s game, and with close examination, there are a lot of reasons to be excited about what he brings to the Blue Jays. We won’t know how the at bats at first base are going to shake down for awhile, and may not get a true picture until a month or two into the season. Justin Smoak returns next season and will likely get a shot to start at first against righties. However, there’s an argument to be made that the role should go to Pearce, platoon advantage or not. Looking at those numbers, one would think that Smoak will need to perform early and often in order to earn himself playing time. We’ve already mentioned that the left field job isn’t locked in to one player, and that could be the case throughout the season. Barring an additional signings, the Blue Jays are set to roll out some combination of Melvin Upton, Ezequiel Carrera, and maybe Dalton Pompey, if the latter can make the team out of spring training. While Pearce won’t bring the same defensive value to left field, he’s got experience in the outfield corners, giving him additional value because of his versatility. He’s not exactly a gold glover in the outfield, but he’s a far cry from the bumbling we watched from Chris Colabello and Danny Valencia a couple years ago. If Smoak is playing well and John Gibbons wants to get both guys in the lineup consistently, Pearce gives him the flexibility to do so. Will 2017 be the year Devon Travis stays healthy? Let’s hope so. However, if he struggles with injury again, the Blue Jays are set up well to cover his absence. Darwin Barney returns on a 1 year deal, after having brought significant value to the Blue Jays last year in dealing with injuries to the keystone. That said, making Barney into a full-time starter isn’t an ideal situation, regardless of how well he played last year. If (knock on wood) Travis gets banged up again, the Blue Jays could move Pearce to second base, which would at least help maintain the offensive output in the lineup. Travis is significantly stronger defensively, but Pearce is definitely serviceable. Call the Blue Jays cheap if you want, but the front office was able to sign Pearce at a very reasonable number. On a 2 year deal with an AAV of 6.25 million, Pearce has the potential to be one of the best free agent signings of this offseason, if all goes well. He won’t replace Encarnacion, but he shouldn’t be expected to do so, at least not on his own. That’s not a bar that’s fair to set for anyone. While Pearce (and Morales) may face some unfair criticism due to trying to fill Eddy’s shoes, Blue Jays fans should be excited about what Pearce can bring to the table. A potential .300 (ish) hitter who has the ability to play first, second, and the outfield, for 2 years, 12.5 million? Seems like a pretty good use of resources to me.